CHARLOTTE, NC — Bruce Johnson, fresh from greeting America’s second Ebola patient to Emory Hospital in Atlanta, now faced fifty reporters and twenty-five camera operators eager to present his words to audiences throughout America and across the world. Johnson, president of SIM USA, shared the story of that August 2014 news conference Jan. 30 during the organization’s public reception, “Missions: Why Go?” It was a fitting introduction to SIM’s long history of hardship and to the keynote address by Nancy Writebol – the missionary who’d been brought home with Ebola – and her husband, Dave. “And I thought, ‘Wow, what a good pitch, to answer that,’ and I said, ‘Actually, in our 121 years, crisis is part of our story. And it started 121 years ago, with three young men in their 20s, who founded SIM. You see, those three young men (two Americans and a Canadian), were called to a people in the interior of Africa, some sixty million people, and to their knowledge and the knowledge of veteran missionaries, the gospel had not reached that area,’” Johnson said. 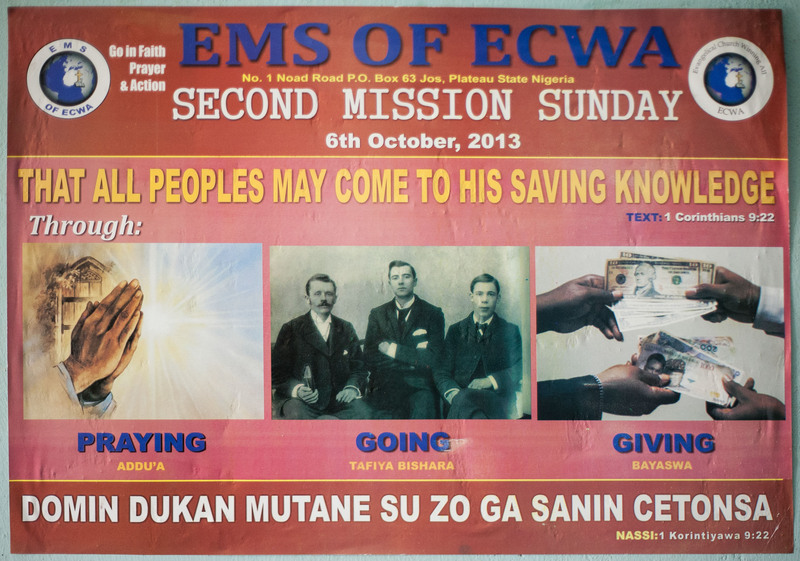 When I visited ECWA’s offices in Jos, Nigeria in November 2013, a missionary recruiting poster featured a photograph of SIM founders (left to right) Walter Gowans, Thomas Kent, and Roland Bingham. Johnson then explained SIM’s origins in 1893, when Walter Gowans, Roland Bingham, and Thomas Kent went to the shores of present-day Nigeria, being told by coastal missionaries not to go inland because they would fail and die. Bingham stayed on the coast to manage support, while Gowans and Kent traveled inland. Within a year, Bingham went looking for them, discovering that each had died of malaria. Bingham also contracted malaria but was able to get home to Canada to recover. Bingham, though, never faltered in his faith that God had called him to serve in African missions, and he never abandoned that calling. He gathered other Christians called to serve in missions and went on a second trip, only to return home with malaria again. For the rest of his life, he directed the organization from his pastorate, sending out more teams. Eventually, SIM’s work in Nigeria blossomed into the Evangelical Church of West Africa, now so numerous and widespread that it is called the Evangelical Church Winning All. It’s a story that continues today in Liberia and many other places around the world. SIM serves in countries plagued by war, such as South Sudan and Burma; terrorism, like Nigeria and Pakistan; natural disasters, like Japan and Malawi; HIV and other diseases; and extreme poverty, such as Mongolia and Bangladesh. Late in January, SIM workers and their fellow Christians in Niger lost homes, churches, schools and offices to fires set by people upset by the actions of journalists in France. SIM’s missionaries were unharmed, but they were not unaffected. They stayed, and they are helping rebuild.